Please join us for our October 10th chapter meeting either in person, or by video-conference. Agenda to include update/discussion from September's Membership Assembly, upcoming AGM/voting delegates for AGM. 1) Arrange a room/camera with your Site OTN Coordinator. If your system is departing early, please disconnect from the event at the desired time. If you do not possess the ability to disconnect from events, contact the OTN Service Desk for assistance. 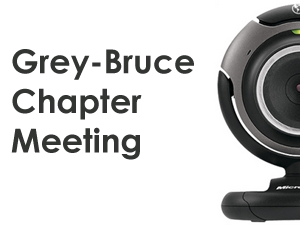 Visit the Grey-Bruce Chapter website.